PRESS RELEASE: Paiste is proud to welcome distinguished artist Robin DiMaggio to its Paiste family of artists. Robin has toured and recorded with music veterans such as Paul Simon, David Bowie, Jackson Browne, Diana Ross, Dr. Dre, Luther Vandross, Sean Lennon, Johnny Cash, and Chris Isaak; as well as with acclaimed world musicians, sitarist/composer Ravi Shankar and violin maestro L. Shankar. He has also appeared on David Letterman and performed at the Grammys, American Music Awards, World Music Awards in Monte Carlo and the MTV Awards. Having travelled extensively from an early age, Robin's music incorporates rhythms and sounds from diverse cultures throughout the world. Robin has recorded three solo albums: Blue Planet, a musical tribute to his world travels, Sphere, a collection of lush, provocative piano solos, and Cinematic Lounge, a larger than life soundtrack. In addition, Robin has recently released a brand-new drum training DVD, Planet Groove, which is a unique look into his 9 different styles broken down into 24 lessons. Robin currently has some exciting new projects in the works, as he was personally hired by Cardinal Poupard from the Vatican in Rome to oversee the upcoming Cathredalia (the largest rock opera written for the SEA Vatican), to be held in Rome, Italy. The vast array of influences in Robin's life has made him a charismatic ambassador of the arts. He has been assigned the returning position of Music Director for the United Nations Millennium Development Goals Awards, to be held in Senegal in September 2009 and in Abu Dhabi in March 2010. He is also the Music Director for the Vijay Foundation Trust, which will host a star-studded event in Los Angeles, December 2009. Robin's most current project is Earthsong, a CD compiled of tracks from top artists in every country around the world. Spearheaded under the United Nations and Humanitad.org, Earthsong is part of a larger effort to save the environment and promote world peace. As the Senior Producer, Robin will be responsible for coordinating "one hundred and ninety two world artists, one hundred and ninety two songs, and seven world-music albums in a united campaign with one world message: no more war." "I have always been dramaticly influenced by Paiste. It might of been the early early years when I would see Jeff Porcaro in the session's and having Joe Porcaro as a teacher which was the Paiste Museum. 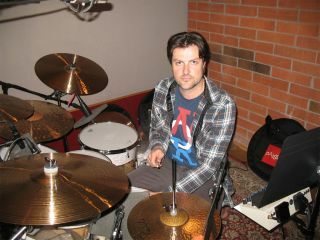 Now I have officially recorded and Toured with The Legend of Paiste. It is with the upmost respect and Honor that i am a proud Artist of the worlds greatest Cymbal Maker!"